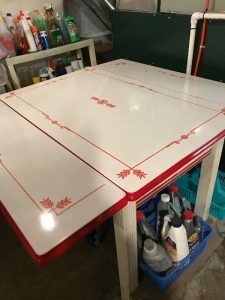 Vinyl Albums & 45s, antique doors, fishing gear, fly fishing lures, reels, supplies, 2 beautiful red & white enamel tables, wood chairs, tools, tools, tools, power tools, new in box, new old stock, portable heaters, washer and electric dryer, building supplies, hardware, vacuum cleaners, large shop vac, small kitchen appliance, pots & pans, dishes, silverware, glassware, crafting and sewing supplies, sewing notions and fabrics, portable sewing machine, antiques sewing machine, tea cart, cameras, school supplies and office supplies, Christmas and Halloween – new and vintage, Byers Choice, antique typewriter ( beautiful ! ), old furniture (great for painter), ladders, dolls, teddy bears, books, costume jewelry, audio and electronics, antique doors, china, microwave oven, Craftsman, lighting, fire escape ladder, vases, Corelle Ware, VHS player, recorder, tapes, 70s retro drop-leaf kitchen table with bench and 2 chairs ( metal legs), working console TV ( great studio prop), baskets, mahogany bedroom set, mid-century bedroom set, upholstered sofa, tables, rocking chair, picture frames & mirrors, vintage clothing, small gifts in original boxes – great reseller opportunity, cleaning supplies, kitchen supplies, bowling balls, yard & garden tools, hats, scarves, gloves, jewelry boxes , linens, blankets, curtains, rugs, placemats, 70s portable tv stand, religious items, Victoria style bench, decorative pillows, mens clothing and shoes, old tennis rackets, annnnnd this list will grow ! !